Our oldest coach, and probably the one of the greatest historic significance. Originally built carrying the number 10155J, but quickly renumbered 1065, it emerged from York works in 1924 as part of the "Flying Scotsman" train (the locomotive from which remains world famous). Being a composite coach it had both first and second class compartments, including a very unusual "half compartment" of three seats facing a blank wall. In 1928 a new train was built for the "Flying Scotsman" so our vehicle was downgraded to standard passenger use. Renumbered 7781 in the early thirties and finally 18033 in 1946, it remained in use until 1959. Its continued survival was then ensured by it conversion to a mess van - which unfortunately necessitated heavy rebuilding (and now numbered DE320741). In this role it served at Knottingley depot until 1973 when a group of RVP members realsied its historic significance and saved it for preservation. Moved to Loughborough in 1981 it then acted as a mess van for a further 10 years before finally moving to Rothley and falling out of use. Currently stored its rebuild will be a major job, but the plan is to return it to its 1924 condition - it is now the only surviving carriage from the first "Flying Scotsman" train. 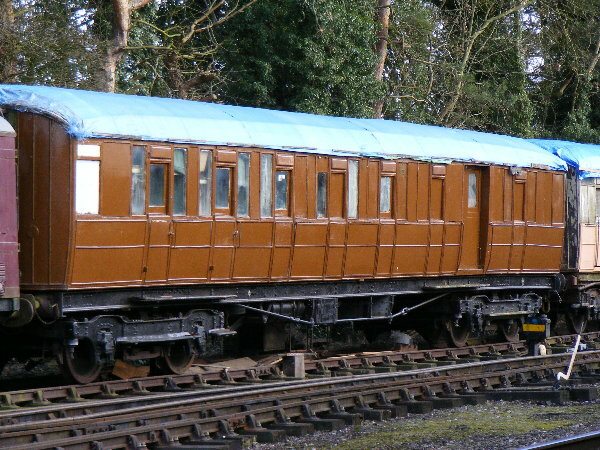 In 2009 this vehicle recived cosmetic attention and is now in brown livery.